This chapter focuses on the development of a risk-based sequential decision-making strategy based on the probabilistic Bayesian-based decision-making strategy in Chapter 4. To accomplish competing tasks under limited sensory resources with minimum risks, a real-time decision-making strategy is developed to dynamically choose the task to be performed based on an overall risk assessment associated with the decision. Risk is defined as the expected cost of decision errors as well as observation costs. The proposed strategy seeks to find and classify all unknown objects within the domain with minimum risk under limited resources. Section 5.1 reviews some related literature on sequential detection and risk analysis. 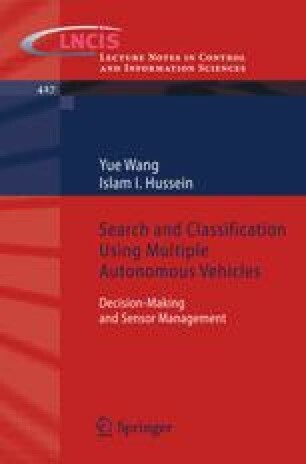 The binary risk-based sequential decision-making strategy using a single autonomous vehicle is then investigated in detail in Section 5.2. In Section 5.3, the binary results are extended to the more general ternary setting, which enables concurrent search and classification observations. The ternary decision-making strategies are then applied to the SSA problem in Section 5.4.